This is no five-step waltz, no quadrille, and by no means is it a cakewalk. 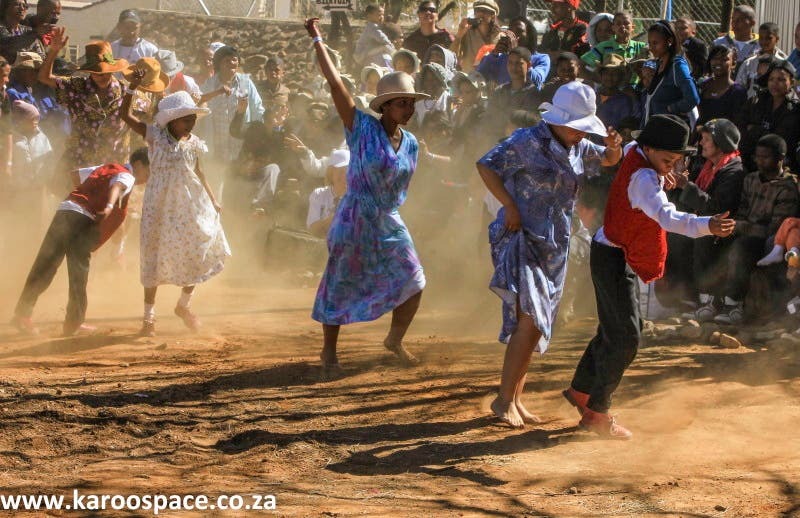 It’s more like a cactus tango or a dusty Jitterbug, this Nama Riel dance they do so well out here in the Northern Cape Karoo. 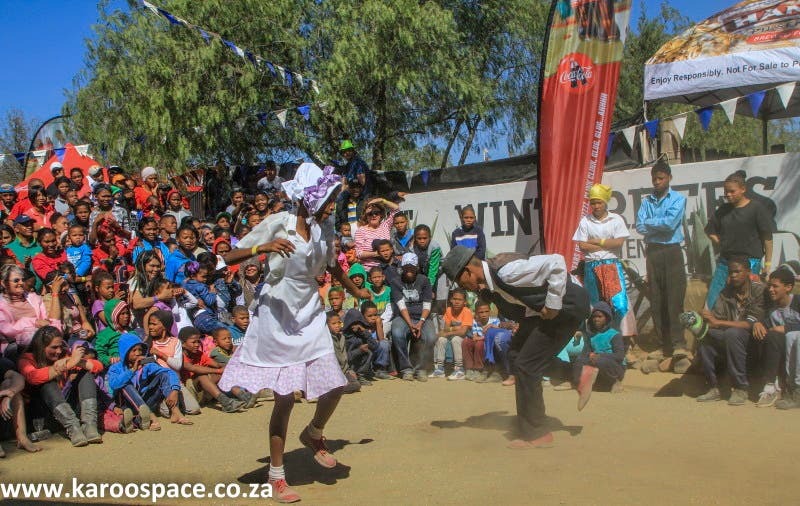 It’s ‘Stomp the Yard’ in Calvinia, Williston, Brandvlei and beyond. 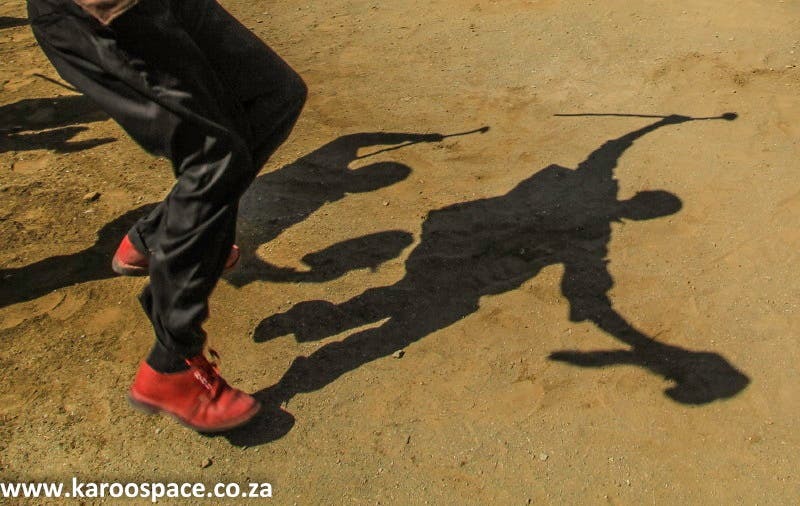 Shadow Dance of the Upper Karoo – the Nama Riel. The cheering crowd forms a square over a carefully prepared piece of dry country. There must be dust, and heaps of it. The wild, twangy “riel” music blares out from somewhere and the groups of dancers enter the arena, flailing their arms and kicking their legs. Dancers enter the arena – but the dust goes first. That’s just the start of a decent Nama Riel. Dancing at the 2015 Williston Winter Fest. Variations of the riel were performed for centuries by the Khoi and San. 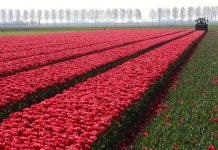 Later, farm workers and sheep shearers all over the far-flung outposts of the Norther- and Western Cape danced the riel. 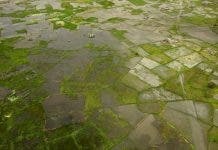 But this wild and unique dance lost its lustre for a while…and was in danger of being a forgotten cultural relic. Elias Nel (florid shirt) – a passionate leader in the Nama Riel culture. 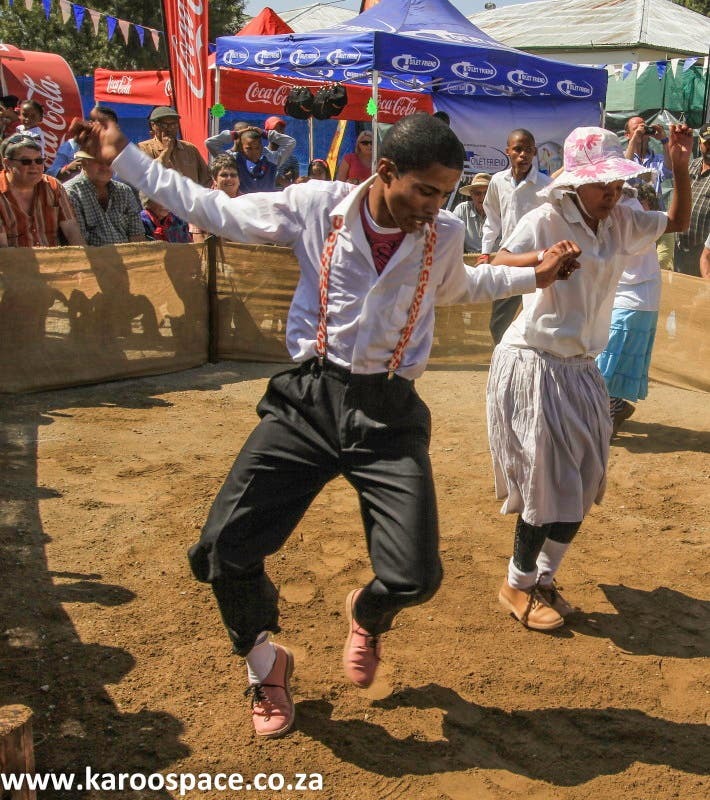 Then an organisation called the ATKV (Afrikaanse Taal en Kultuur Vereniging – Afrikaans Language and Cultural Association) began to revive the mystical love dance, staging a number of performances and competitions all through the region. Instrumental in this renaissance was the legendary Elias Nel, a riel dance expert. The Nama Riel moves are fast and intricate – and mostly about love. In the dance lines the girl dancers keep to one side while the boys mock-battle their rivals and do their best to charm their chosen darlings with flashy moves and big hats festooned with ostrich feathers. This Nama love dance normally ends in peace, triumph and a romantic puff of dust. The Williston Mall – where it all began. 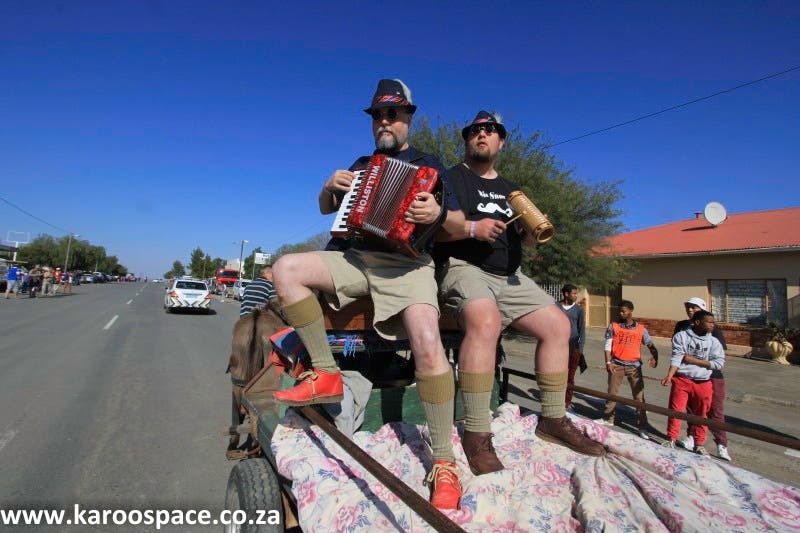 The idea of a festival celebrating the Nama Riel took root on a blistering midsummer’s day in the Upper Karoo back in 2009. The chief co-conspirators were Elmarie and Pieter Naudé, who own a guest house called Die Ark, aka The Williston Mall. 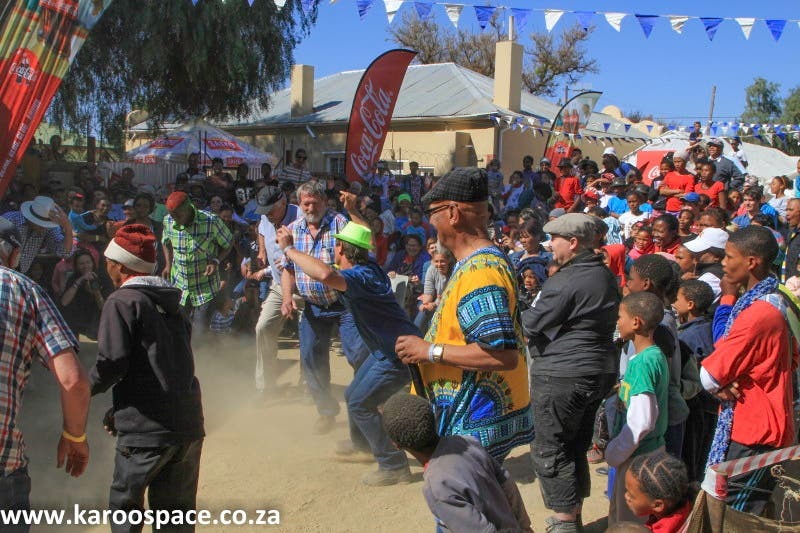 Williston, a small village that lives at the corner of Nowhere Street and Forgotten Avenue at the far end of the Northern Cape, would celebrate all that was good and colourful in both the local Nama and Afrikaans communities. 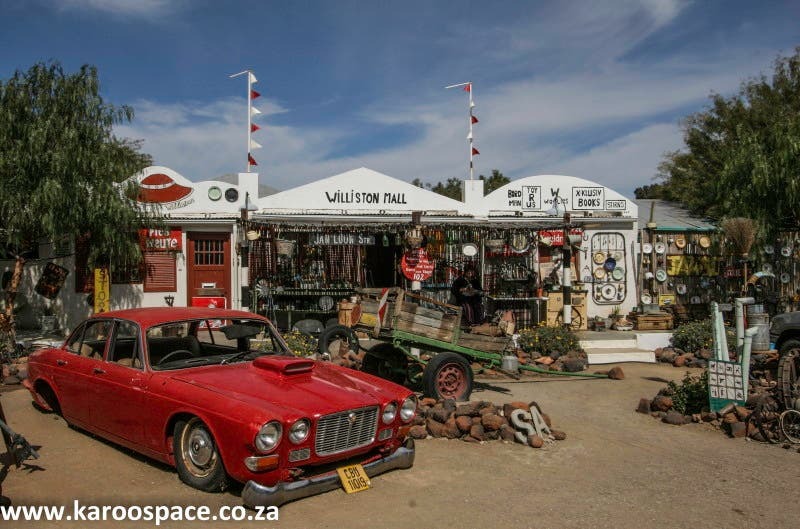 Williston, Northern Cape – in the land of the corbelled house. The first festival, held in 2010, was relatively modest. Identical red-haired twins arm-wrestled, a local girl-group called Die Madeliefies sang their hearts out, a New Rock band from Cape Town took the night shift, the Williston Youth Brigade clanged merrily through the streets and a jolly group of amateur theatrical types drove all the way from Cradock to stage a number of shows. The Williston Stoftrappers – old festival favourites. 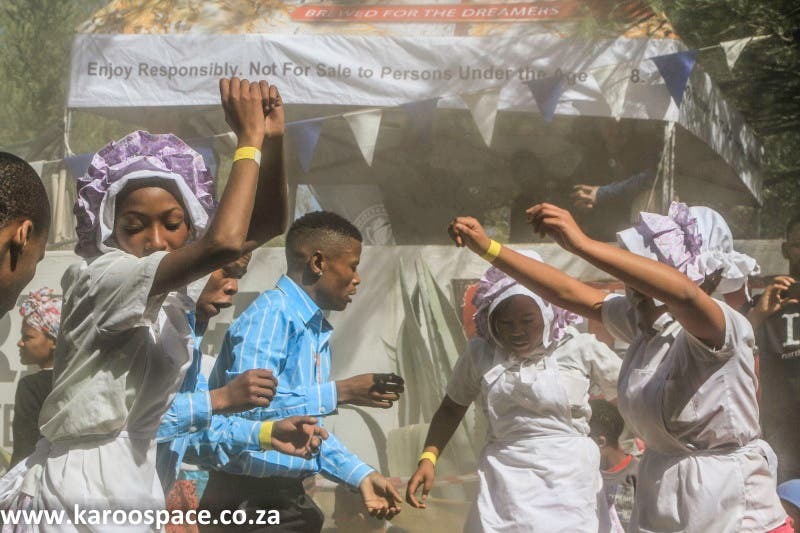 The next year the Nama Riel dance groups arrived in earnest, along with the Kalahari Orkes and the Silver Creek Mountain Band and Tannie Grietjie from Garies and Boeta Gammie from Calvinia. So too did groups with great names like the Klipwerf Orkes, the Calvinia Sitstappers and the Brandvlei Snaar Orkes. The main performance stage was pure Karoo: the flipped-open back of a Leyland sheep truck where you played your songs in all weather conditions. A party for everyone – Williston Winter Fest 2015. 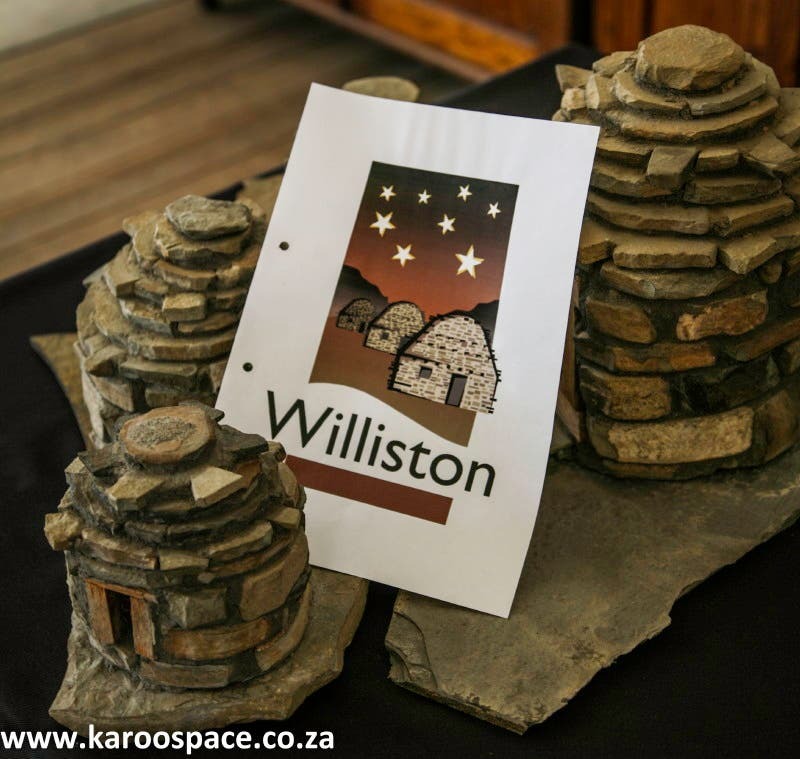 By 2015 the Williston Winter Festival was regarded by many who love the Karoo as one of the top annual gatherings in South Africa. The Nama Riel and its delicious, dusty madness was the main attraction. And for Pieter and Elmarie of The Williston Mall, it has been great to see a moment of madness turn into sweet success. Chris Marais and Julienne du Toit live and work in Cradock, in the Eastern Karoo, when they’re not travelling around the heartland in search of stories. They write for SA Country Life magazine regularly, have written two books on the Karoo (Karoo Keepsakes I and II) and run a website called www.karoospace.co.za and have just launched their e-Bookstore on Karoo Space.